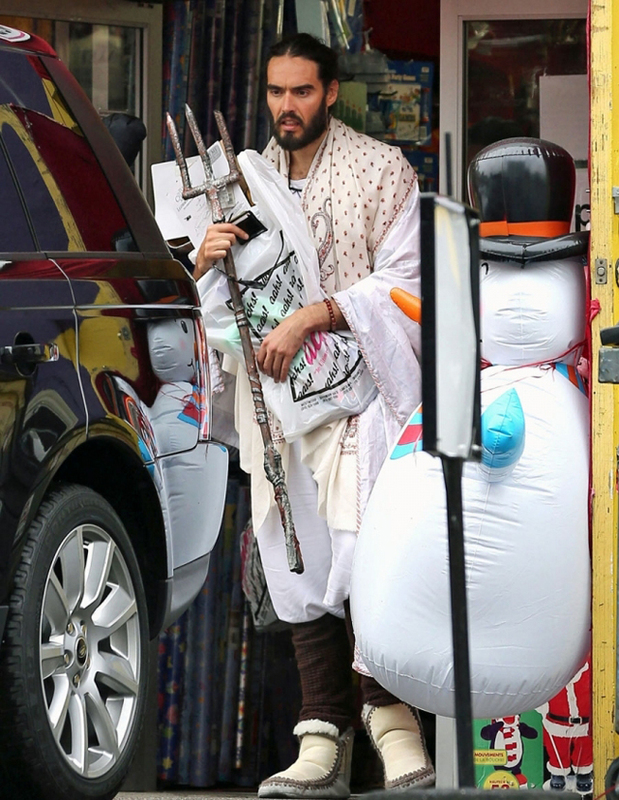 Earlier today in a place not cold enough to warrant boots like that, Russell Brand and his partner Frosty robbed what appears to be a plastic bag and various loose papers store. Brandishing his mighty trident, Brand probably threatened the poor shop keep while the snowman leered menacingly. He would have been able to do more but his tiny arms were more useless than Cee Lo Green’s. Seriously look at him. Everything he is wearing probably costs more than my couch but it is all stuck together like a kid playing dress up. Combining expensive things doesn’t make them better, Russell Brand. You can’t cut out the Mona Lisa’s face and glue it onto the statue of David and make it twice as arty! Stupid rich wizard. P.S. If you don’t make at least one movie a year you aren’t famous. I don’t need anything. Except this trident. Just this trident… And this snowman. The trident and the snowman and that’s all I need. Wait, do wizards use tridents? Maybe I missed something. Someone sounds a bit jealous. And bitter. I would just kick him in the nads and give his trident to Eva. OK, I’m always bitter. Another new Hobbit movie – Lord Barf of Morderp.